This page covers controls for the Windows PC, Macintosh and PlayStation games. Click these links to download the Nokia N-Gage or Pocket PC manuals. Follow this link for the official manual in PDF format. Follow this link for a Tomb Raider I: XBox/Playstation Controller Fix by CrimsonBlitz and posted on the Steam community forum. 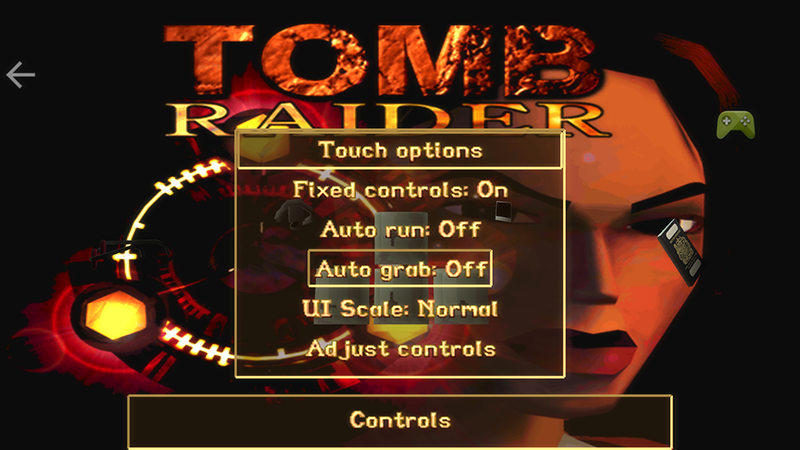 The following lists basic controls, as well as complex moves involving combinations of controls for Tomb Raider, Tomb Raider Gold and the Unfinished Business expansion. Most Macintosh keys are the same as those for the PC. Where they differ, Mac controls are listed in green. PlayStation controls are in blue and Sega Saturn in orange. Instructions for saving and loading games, using the inventory, etc., are at the bottom of the page. IMPORTANT: If you are coming to TR1 after playing the later games, note that there are fewer, simpler controls. Lara cannot crouch or crawl, sprint, climb ladders or monkey bars, use flares, binoculars or vehicles, swing on ropes, etc. If you have never played Tomb Raider before, you should also familiarize yourself with the unique control system for jumping. It seems odd at first, but it is actually very easy to make Lara do what you want if you just follow certain basic steps, covered on my Tips & Strategy page. NOTE FOR iOS/ANDROID GAME: The touch controls are fairly straightforward except when you need to drop down after traversing along a narrow crevice. To do this, you must first turn off auto-grab in the Controls menu. Then hold Action to hang on as you traverse and release it to let go. See the note above about safety dropping in the iOS/Android game. Note that for some weapons, ammo is tracked differently before and after you obtain the weapon. For example, each magnum clip pickup is actually 25 rounds. Before you obtain the magnums, each pickup is counted as one item in your inventory. Later, when you get the gun, the number of magnum rounds in your inventory appears to multiply, but actually the game starts counting individual rounds instead of pickups. Similarly, if you've collected 10 Uzi clip pickups, they're counted as 500 individual rounds once you get the Uzis. Shotgun shells are counted individually both before and after you obtain the weapon. Copyright © 1998- Stellalune. Special thanks to Maurice for the PlayStation menu controls and Restz for the Saturn controls. All rights reserved. Feel free to link to this page but do not copy it. To give me your feedback, send email to or visit tombraiders.net. The name and likeness of Lara Croft, Tomb Raider screenshots and the Tomb Raider name and logos are copyright © Square Enix, Ltd. All rights reserved.